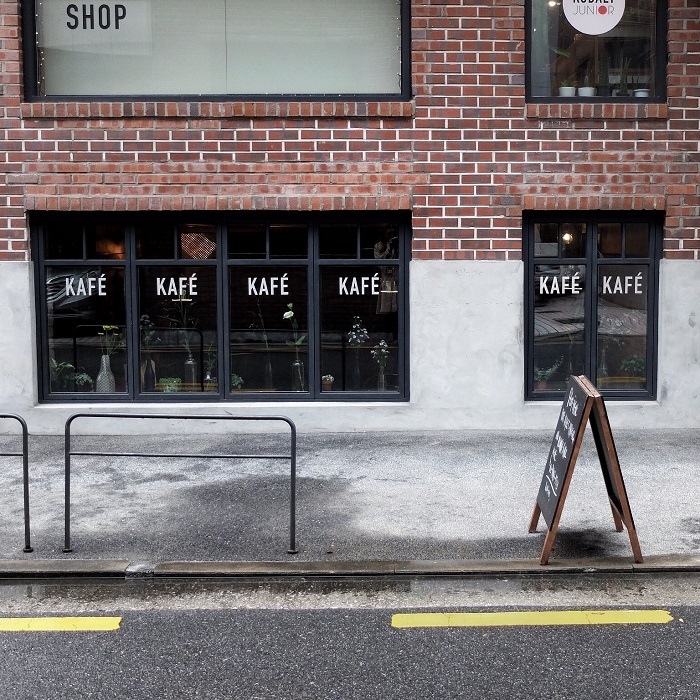 Cafe 4M - The Base is an artistic coffee shop located in the chic neighborhood of Sinsa, Gangnam. Only a minute walk from the trendy Garosugil street, this is one among the great places nearby to take a break and enjoy a coffee. There are two floors upstairs, one in the basement and a long covered terrace on the main floor, as well as an art gallery and a bakery. 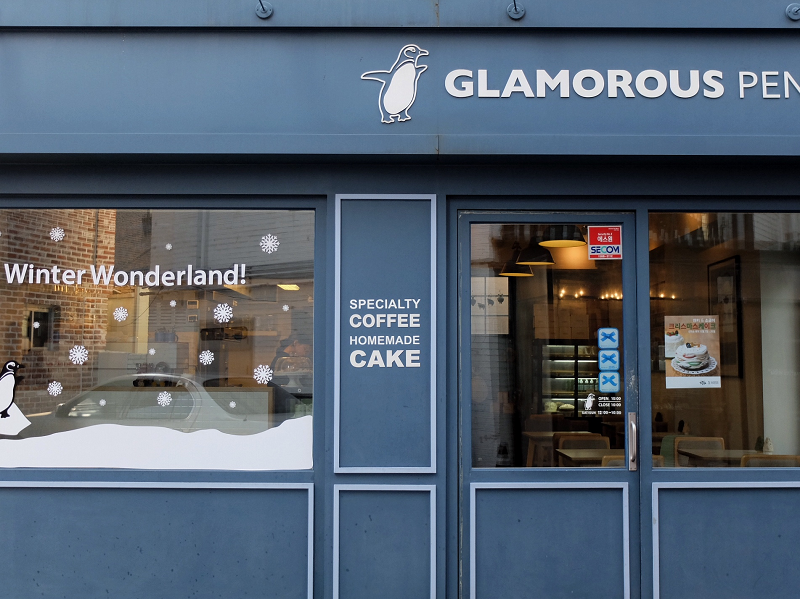 The latest might be in one of the two other cafés located in Anguk-dong and Nonhyeon-dong, but you still find three or four basic cakes at The Base. One cannot not be surprised by the amazing large range of drinks, from coffee to tea, homemade ades, cocktails and special 4M signatures – dark Oreo and almond vanilla, to say some. The average cost is between 6.000 to 7.000 wons (5 to 6$) for coffees and lattes, and around 8.000 to 9.000 wons (7 to 8$) for teas and other drinks. Baristas prepare your coffee at their hand drip bar, and ask you to choose between four different coffee blends - Perle noire / Florio / Mariclara / Crema d'oro - according to your taste and how strong you want it . 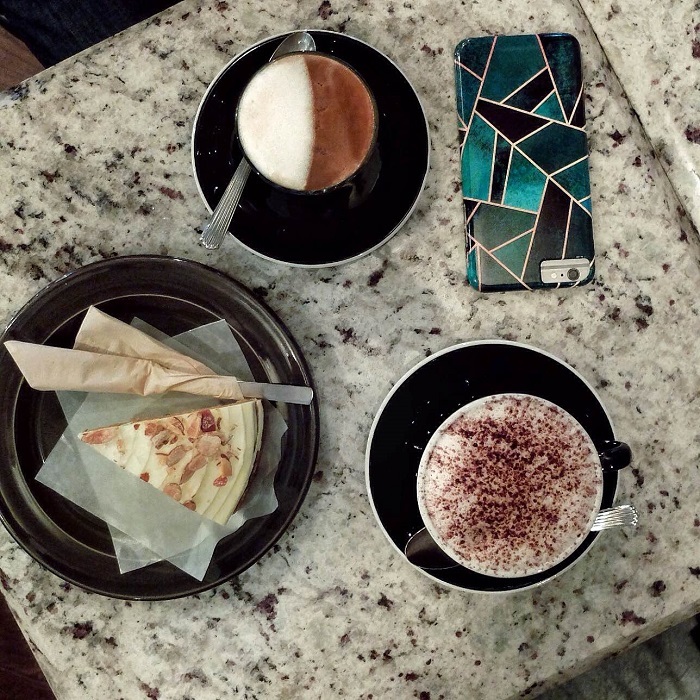 Even for a simple latte lover, you can twist it by having a different blend if you're not into vanilla or nutty things. This is an interesting and attractive concept which makes you feel like you took part in your coffee's making. 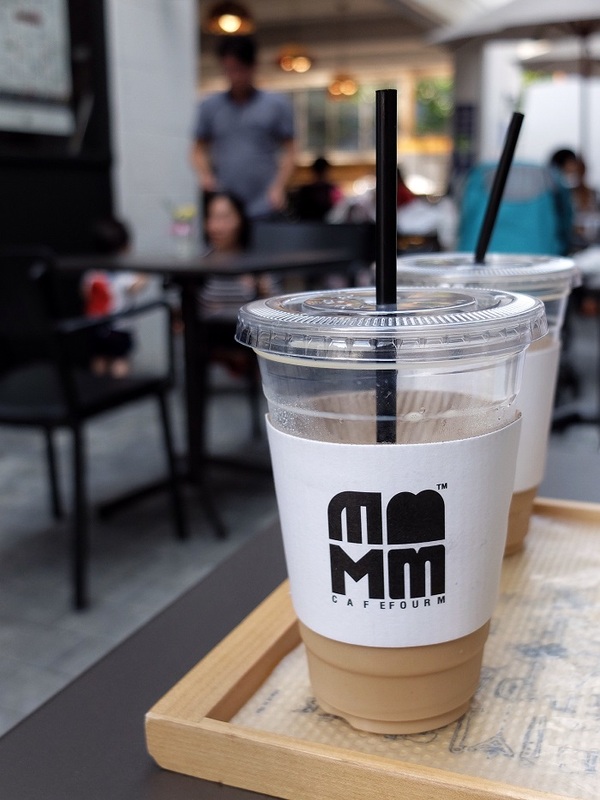 One of my friend took me to this coffee shop on a hot summer afternoon to enjoy iced drinks on the covered terrace. 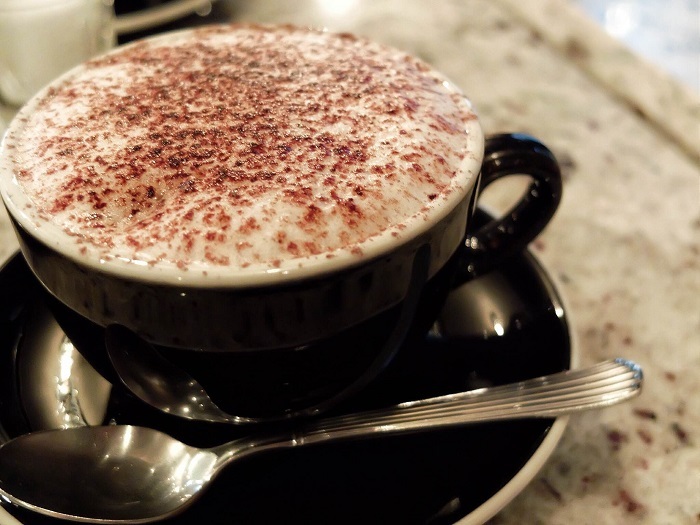 I had the hazelnut latte with the Florio blend but it was not nutty enough, it tasted like a basic latte so a real hazelnut lover would certainly get mad. Still, for me, the light coffee flavor was excellent, and the fact you can choose your blend is definitely a plus. Now, as cakes are the foundation of my food pyramide, I had to try theirs out or my day wouldn't have been complete. 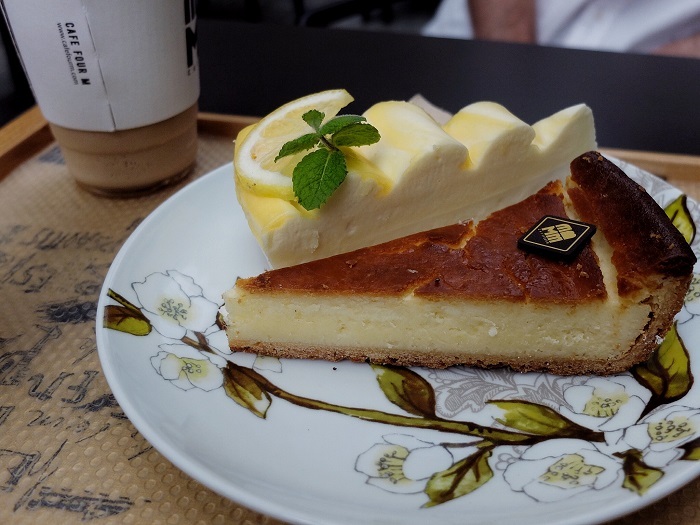 We had one slice of a newyorker cheesecake and one of a lemon cheese mousse cake. 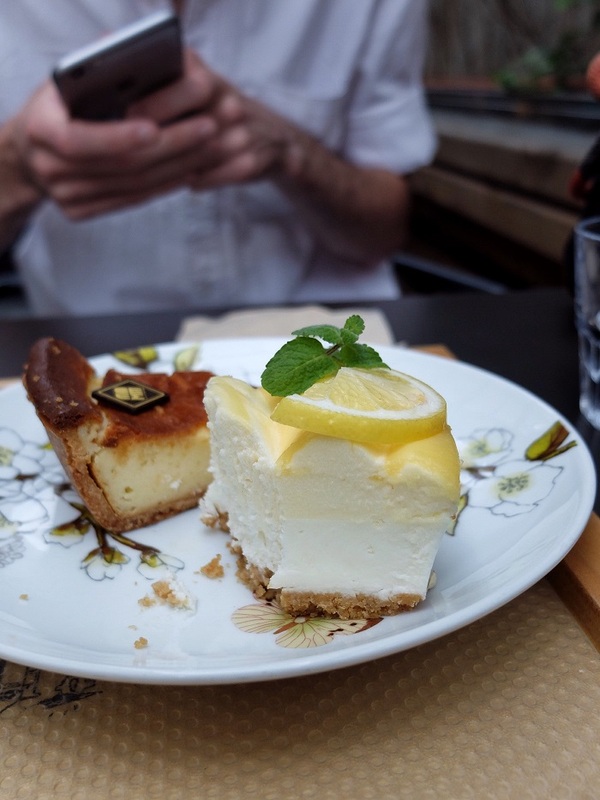 The two were delicious but I must say the lemon one would get an A for its multiple textures (mousse, cream, biscuit) making it less flat, and I personnally love not baked, Japanese rare cheesecake better. In winter I guess you have to try their brownies with a warm mocha, it must be the perfect combination on a snowy day. 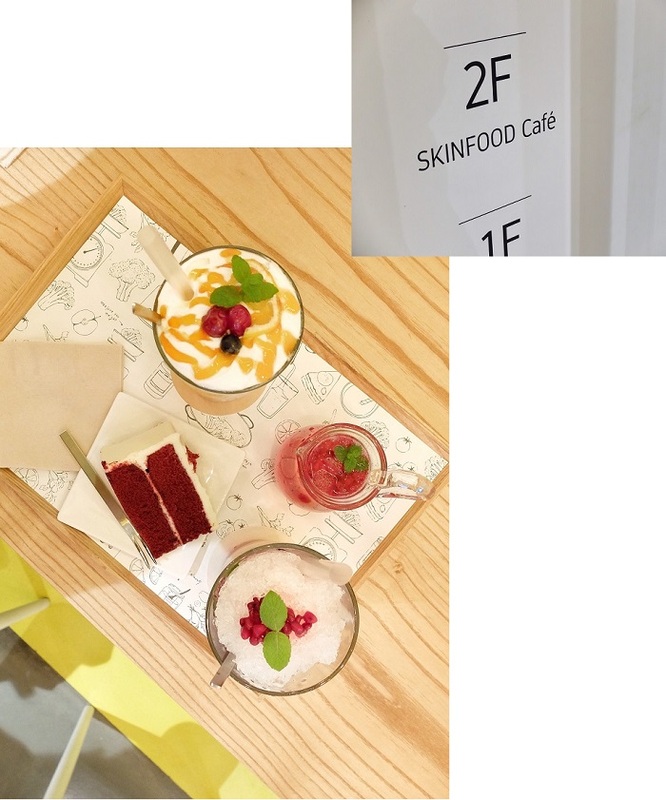 Concerning the café atmosphere, it was quiet as the place is very spacious, you can enjoy your chat without being disturbed by people at the next table. The art pieces on the walls upstairs seem to change every month to promote independant artists. This is one point I truly appreciate in Sinsa neighborhood, this pure artistic sensibility which contrasts with the more glamorous but somehow artificial places in Gangnam. The covered terrace is perfect on summer days, you can sip your refreshing ade while being in the shade. Kafé Kolbalt, also located on the left side of Garosugil street when coming from Sinsa station, is a very cute European-style café. 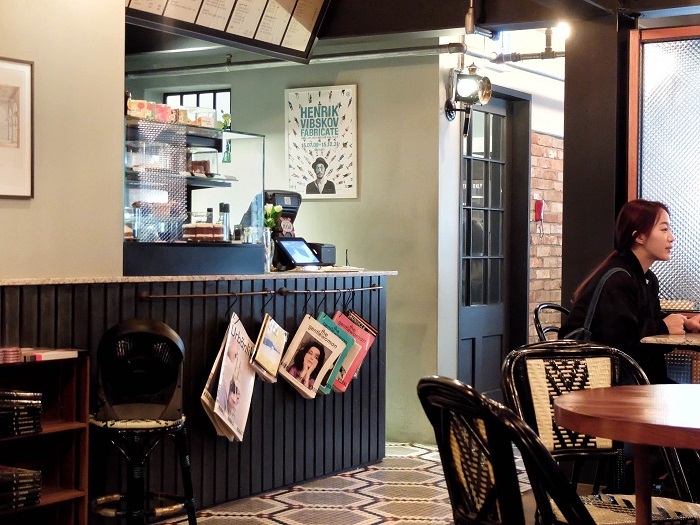 It is a mix between a French bistro and an English brunch place, with this gentle touch of a quiet Netherlands coffee shop where you wouldn't mind spending the whole afternoon reading books. The cafe is on the basement but you can see the inside from the street through their large windows, and they have some seats on the terrace in summer. The first thing you'll notice when going down the stairs is the mesmerizing tiles - simply lovely. Brown, white and faded red, flowered tiling definitely gives this very bistro vibe. You'll find the counter on the right, magazines hanging under, and a big mirror at the back of the room. 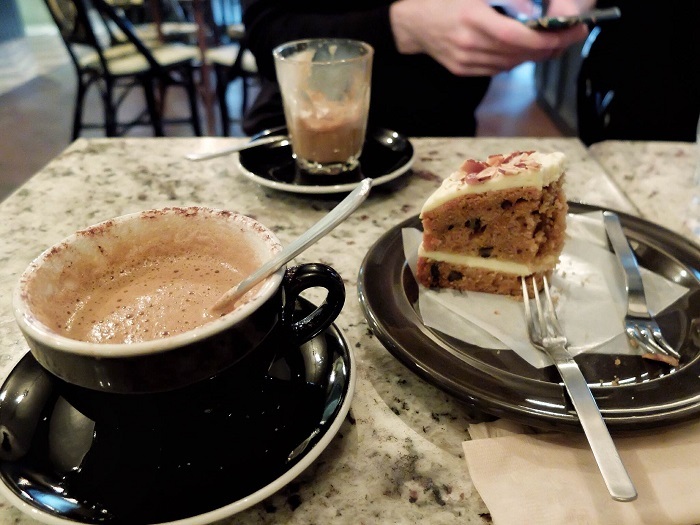 The place is generally very quiet, soft music in the background, so you can enjoy a calm lunch or have afternoon talks with your lover while sipping coffee. At evening, the low lights flood the space with warthm, making your meeting even more intimate. The drinks choice is quite basic for coffee, for a mocha count around 8000w (7$), but they have lot of French and English teas with fantasist names. They also have salty meals on the menu, like french ratatouille, and some sweet cakes – cheesecakes, brownies and tarts. 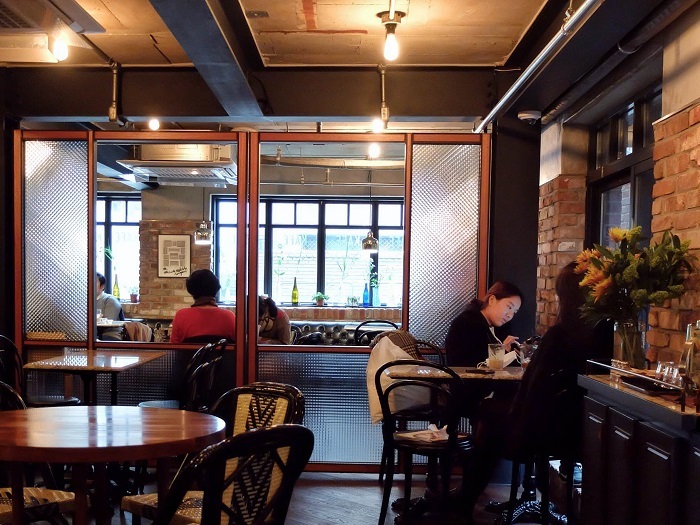 I spent two hours with my British friend in there and I can tell you it was enough to make me forget I was in Seoul – well, except the staff taking your order in Korean. The atmosphere really is the same as in french cafés, low lights, warm glow, and my friend was right when he said I would love the interior. When I first step in, I was in awe with the floor. I mean, hexagonal tiles rock. Then, when we sat at the back of the room, I fell in love with the tables. There is no doubt I need a marble table in my kitchen later. 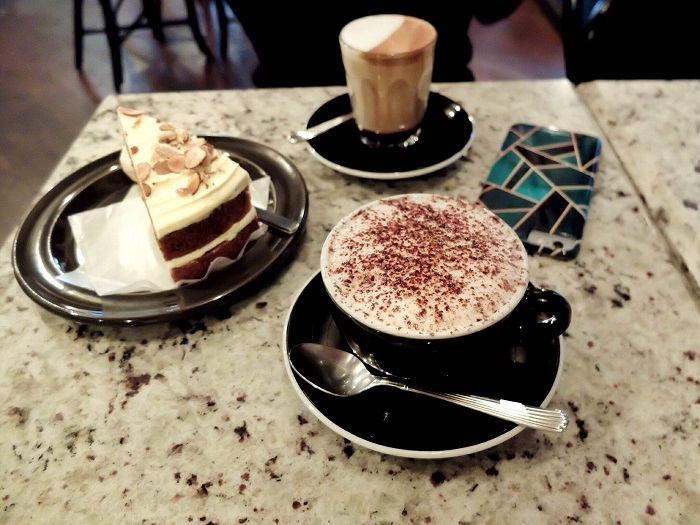 I had a mocha as usual and my friend had a flat white – latte lovers but we didn't know the exact difference. Mine was very good for the taste and quantity, his cup was a little small for the price. As a huge carrot cake fan, I got curious and went for it even if I wasn't especially hungry. I love naturally sweet, very moistured and cinnamon-y carrot cake, but this one was quite flat in spices. I'm not really the type of saying negative comments, but here I could totally have saved my money on this or go for the fig tart instead. 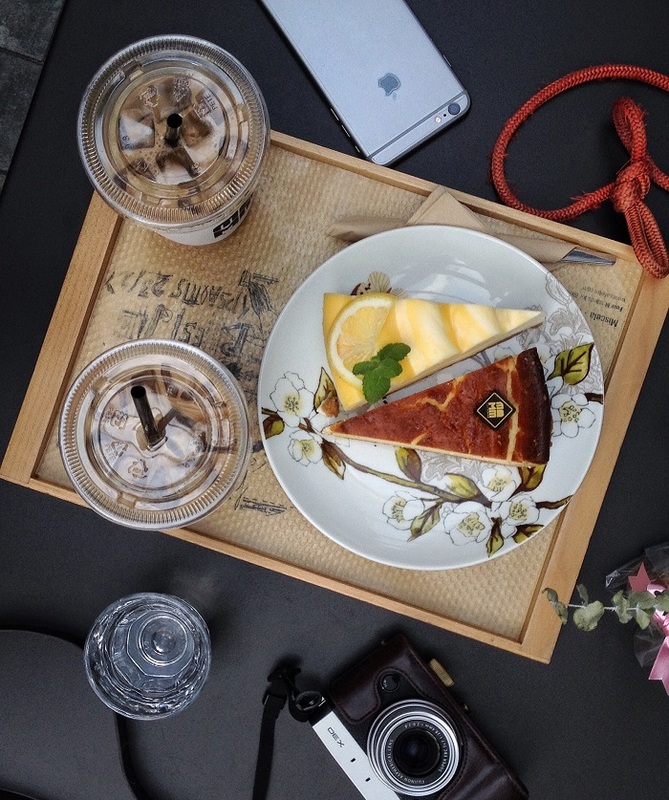 You can definitely find better cakes place in Garosugil for you cakes lovers like me. Still, looking on the net, their salty meals look pretty delicious, so Kafé Kobalt should be seen as a bistro instead of a coffee shop. People looking for a quiet place to have a little more intimate lunch, in a frenchy atmosphere, would definitely like it! 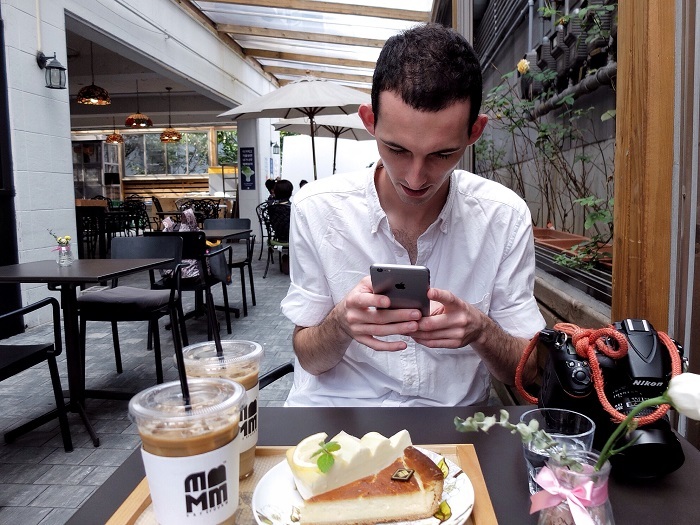 Let me know which are your favorite cafés in Seoul! Maybe one or two vanilla tea lattes will help me, too. Are you getting excited for Xmas season?